This article is about Mewtwo's appearance in Super Smash Bros. Ultimate. For the character in other contexts, see Mewtwo. Mewtwo (ミュウツー, Mewtwo) is a playable character in Super Smash Bros. Ultimate. It was confirmed on June 12th, 2018. Like in Melee, Mewtwo is once again an unlockable character. Mewtwo is classified as fighter #24. Keiji Fujiwara's portayal of Mewtwo from Smash 4 was repurposed for Ultimate. Play VS. matches, with Mewtwo being the 60th character to be unlocked. Clear Classic Mode with Fox or any character in his unlock tree, being the eighth character unlocked after Wolf. Have Mewtwo join the player's party in World of Light. With the exception of the third method, Mewtwo must then be defeated on Spear Pillar. Mewtwo is overall a very polarizing character, not falling under one specific character archetype; despite being tall with a slew of powerful moves, Mewtwo is a lightweight fighter. Its overall mobility is among the best in the game, boasting among the fastest walking, dashing, and air speeds, along with average falling speed and gravity, which gives it a fairly good approach and a very potent neutral game. Mewtwo's greatest strength is its air game. Its aforementioned high air speed, average falling speed and gravity allow it to maneuver in the air effectively, and has a very high double jump in order to punish high recoveries, as well as catch up to opponents who stall in the air. Another noteworthy aspect are its aerials; its neutral aerial has a variety of uses, as its very low ending lag gives it great combo potential into its other aerials, or Mewtwo can drag opponents down with it for grounded followups. Its forward and back aerials are very useful combo extenders and can KO at high percentages, with back aerial in particular covering a large area behind it, making it a potent edgeguarding tool. Up aerial, like back aerial, has large range, and is useful for juggling and has KO potential near the upper blast line. Lastly, its down aerial is a very powerful meteor smash when sweetspotted, and still has KO potential when sourspotted at high percents. However, it hits on frame 15, which makes it Mewtwo's slowest aerial when it comes to startup (although its startup overall is somewhat fast for a meteor smash, compounded with its high power). Another one of Mewtwo's primary strengths is its potent grab game. While its grabs' speeds and ranges are only average, its throws are very versatile. Forward throw, when all of its hits connect, becomes one of the most damaging throws in the game, giving it damage racking potential and ability to refresh its stale moves. Its up and back throws are among the strongest of their kind, with up throw being able to KO under 165% against any character, and back throw KOing under 100% at the ledge against most opponents. Lastly, its down throw is a useful mixup combo starter at higher percentages, and can also be used to read an opponent's reaction and capitalize on it. Overall, both its air game and grab game give Mewtwo a variety of options to quickly rack up damage on its opponents. Mewtwo's varied attributes and moves also give it among the best recoveries in the game. Its combination of a high air speed, high double jump (the highest in the game), and average falling speed give it great offstage survivability, along with all four of its special moves providing a form of assistance with recovery; Shadow Ball's recoil can push Mewtwo back far enough to be a viable horizontal recovery option if facing away from the ledge, Confusion temporarily stalls it in the air, Teleport offers a long distance along with full intangibility and maneuverability, and Disable being able temporarily slow down Mewtwo's falling speed. With these options, Mewtwo has many options to mix up its recovery and allow it to safely get back onstage. In comparison to its air and grab games, Mewtwo's ground game is more powerful, albeit riskier. While overall strong, all but a few of its grounded moves have noticeable ending lag, therefore makes them unsafe if shielded, whiffed, or dodged. One of its best ground moves is its neutral attack; it's a versatile move for many reasons, as it can both jab cancel and jab reset, which allows Mewtwo to start combos more consistently. Its tilts also have their uses. Forward tilt is a good move for creating space at low-mid percentages, and can KO outright at high percentages near the ledge. Its up and down tilts are very reliable combo starters due to their long ranges and different hitboxes, each having varying angles and knockback. Lastly, its smash attacks have distinct perks as well; its forward smash is powerful and can be angled, but is very punishable due to having noticeable startup and ending lag. Its up smash has low startup despite its range and power, and it functions as a great anti-air attack due to having a large disjoint that covers above Mewtwo. However, it has the highest amount of ending lag out of its smash attacks, making it very punishable. Lastly, down smash only hits on one side, but it has very high knockback scaling and has very low ending lag. Lastly, Mewtwo has a versatile special moveset. Shadow Ball has many uses regardless of charge; it can stop approaches, has zoning potential, and is one of the strongest projectiles in the game when fully charged, being able to KO at realistic percentages. Confusion has multiple functions, as it can function as a command grab, a reflector, and even temporarily stall Mewtwo in the air, which can improve its recovery. Teleport grants intangibility and travels far with large horizontal momentum, which makes it a safe and versatile recovery option. The last of Mewtwo's special moves is Disable; as it grants intangibility on startup, it is very useful for punishing bad reactions and can secure KO confirms. However, it's risky to use otherwise because it has to be facing the opponent in order for it to work. Despite Mewtwo's strengths, it has some noticeable weaknesses. One of which is its infamously poor endurance; Mewtwo's very light weight makes it easy to KO, while its tall frame, average falling speed and average gravity make it easier to combo compared to other characters of its weight class. Furthermore, Mewtwo lacks an effective aerial move to disrupt combos, and an attempt to Teleport out of a combo can be punished due to its noticeable ending lag and momentum. The majority of Mewtwo's moveset also possesses some restrictions in spite of their advantages. Mewtwo's tail is only disjointed at its tip on attacks that utilize it, which makes its tail attacks susceptible to being countered. Fully charged Shadow Ball has recoil when used in the air. Disable is punishable if it whiffs and can be reflected because of its status as a projectile, the latter of which can easily lead to a fatal turnabout against Mewtwo at high percentages. Mewtwo, while having a multitude of KOing options, often has trouble landing them. Up and back throw can be risky to attempt because of its aforementioned average grab range. Forward and down smash have slow start-up lag, whereas up smash has minimal horizontal range below its blast of dark energy and high ending lag. Despite their speed and accuracy, forward aerial and Shadow Ball's KO potentials can be hindered via staleness because of their frequent usage in Mewtwo's combos and neutral game, respectively. Lastly, its frame data is slightly below-average, which makes its attacks even more prone to punishment if they are not spaced well. As a result, Mewtwo can pressure effectively, yet is also vulnerable to pressure. Overall, Mewtwo is a non-traditional glass canon who falls under the category of the bait-and-punish archetype; Mewtwo must play cautiously and aware so the opponent doesn't capitalize on its tall hurtbox and light weight. However, this does not mean Mewtwo is forced to rely on turtling, as its outstanding mobility, excellent air game, and overall powerful moveset make it a force to be reckoned with. As such, Mewtwo is a "high-risk, high-reward" character with a fairly high learning curve, as it has to capitalize on reads more often than not because of its frailty and susceptibility to pressure. Mewtwo's competitive potential is up for debate. Players like ESAM and Armada believe that Mewtwo should be ranked in the higher tiers due to its excellent mobility and damage racking game, while other smashers ZeRo and VoiD consider placing it in lower tiers due to its very large hurtbox and light weight, as well as its potent neutral being toned down slightly. Mewtwo itself has a very small playerbase, but the players who are dedicated to maining the character, like SDX have managed to get decent results. Mewtwo has received a mix of buffs and nerfs, but like most other SSB4 top tiers, it has been nerfed overall in its transition to Ultimate. It benefits greatly from the ability to dash-cancel into any grounded move, which alleviates most of the problems with its very low traction (which itself has substantially increased). Its superb mobility has become even better, and most of its viable KOing options have improved with better knockback and/or range, and has gained a few new ones as well. Its survivability has also improved slightly due to Mewtwo's increased weight, and the readdition to directional air dodges improve its own air dodge's mindgame potential. However, Mewtwo has received several nerfs to counter the buffs, one of which is to its special moveset. Shadow Ball is smaller and slightly weaker when fully charged, which marginally worsens its KO potential. Confusion has lost most of its use as a recovery move as it halts most of Mewtwo's horizontal momentum in the air, and followups off of it can be a bit harder due to the command grab not centering opponents in the middle of the ripple. Disable is also harder to hit on smaller characters due to its altered hitbox placements. Its already below-average frame data was worsened slightly with increased ending lag on many of its moves, most notably up smash and its grabs. Mewtwo's tail hurtbox was increased, which gives it a harder time to utilize its disjointed tail attacks. 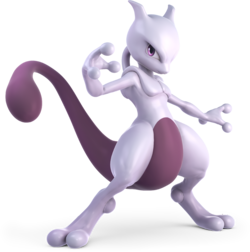 Mewtwo's potent neutral in Smash 4 was also toned down due to some of its tail attacks having shorter reach and more lag (Down tilt, in particular, lost some of its utility it had in Smash 4) Lastly, its air dodge, commonly considered by many in Smash 4 to be the best air dodge in the game due to its speed and mindgame potential, has been nerfed when it comes to frame data, having slightly increased startup and much more ending lag, now functioning as a more standardized air dodge that fits in line with the rest of the cast. Despite the improvements made to Mewtwo's kill power, aesthetics and the benefits it received from Ultimate's mechanics, Mewtwo's nerfs outweigh its buffs and is considered to be less effective than its iteration in Smash 4. As such, Mewtwo has not made a significant impact in Ultimate's early metagame as its playerbase is very small. Abadango, WaDi, and Rich Brown, notable Mewtwo mains from SSB4, have dropped it in favor of other characters. SDX, however, has used Mewtwo and has achieved good results with the character despite the nerfs. Mewtwo has a more subdued color scheme and its body appears to have a glossy sheen. The end of its tail is also slightly larger. All attacks that utilize darkness have more intense particle effects. Mewtwo's idle pose has been altered; it now keeps one of its arms lifted. Mewtwo's falling animation has been altered; it does not keep it arms folded, only doing so when falling forward or backwards. The pose where Mewtwo laughs and floats has it float higher and look farther away from the screen. The pose where Mewtwo thrusts its hand outward has an altered camera angle more towards its hand. Like all characters, Mewtwo's jumpsquat animation now takes 3 frames to complete (down from 5). Mewtwo runs faster (2.05 → 2.255). Mewtwo's initial dash is significantly faster (1.4 → 2.255). Mewtwo walks slightly faster (1.2 → 1.26). Mewtwo's air speed is higher (1.25 → 1.313). Mewtwo performs its double jump more quickly, improving its recovery and combo game. Mewtwo's falling speed and fast falling speed are slightly faster (1.5 → 1.55) and (2.4 → 2.48) respectively. This improves its survivability but makes it more susceptible to combos. Mewtwo is slightly heavier (74 → 79). This improves its survivability but makes it more susceptible to combos. Air dodge has more startup (2 frames → 3) and significantly increased ending lag (FAF 28 → 51). Backward roll has more ending lag (FAF 30 → 35). The size of Mewtwo's tail hurtbox has been slightly increased to near its tip. This reduces the disjoints of Mewtwo's attacks involving its tail, and gives it a slightly bigger hurtbox overall. Air dodge grants more intangibility frames (frames 2-24 → 3-26). Jab 1 has an altered angle to keep opponents closer to Mewtwo. This allows it to connect better with its infinite and jab reset, but weaken its guranteed jab cancel setups in Smash 4. Neutral infinite's finisher deals slightly more damage (2% → 2.5%) and knockback. Rapid jab comes out faster (frame 9 → 5). Jab transitions into rapid jab slightly later (frame 11 → 12). Rapid finisher has more ending lag (FAF 36 → 41). Forward tilt has a new animation; Mewtwo spins horizontally to strike with its tail. Forward tilt always sends opponents in front of Mewtwo. Forward tilt has increased range and deals more knockback, granting it KO potential. Up tilt has improved hitboxes. It properly connects with opponents behind Mewtwo. Up tilt has a slightly altered animation. Down Tilt has slightly more ending lag (FAF 21 → 24). Dash attack has an altered animation; Mewtwo lunges forward with one hand. Dash attack deals more damage (10% → 12%), without full compensation to the knockback, thus KOing sooner. Forward smash can be angled. Forward smash deals more damage (19% → 20%) and significantly more knockback. Up smash's energy swirl is opaque and stylized, instead of being a translucent whirl of particles. Up smash has increased range. Up smash hits 4 times instead of 7. Up smash's final hit has less startup lag (frame 35 → 23). However, the move's total duration remains unchanged; coupled with the move's reduced hits, the move has significantly more ending lag overall (34 → 46 frames) and is less effective for catching an opponent's options. Down smash deals more damage (15% → 16%) and knockback. All aerials have less landing lag (13 frames → 10 (neutral), 14 frames → 8 (forward), 17 frames → 10 (back), 13 frames → 8 (up), 18 frames → 11 (down). Neutral aerial has altered visuals; rather than emitting multicolored orbs, Mewtwo discharges electricity around itself while flashing with a blue overlay. Neutral aerial's final hit comes out much sooner (frame 40 → 28); this, combined with the move's increased duration (FAF 46 → 50), results in the move having significantly more ending lag overall (6 → 22 frames). Neutral aerial hits fewer times (9 hits → 6), but deals the same damage, improving its damage consistency, but reducing its hitbox duration. Forward aerial has increased range and launches at a lower angle. Forward aerial has slightly more start-up lag (frame 6 → 7). Forward aerial has more ending lag (FAF 38 → 40). It auto-cancels later (frame 36 → 37). Back aerial has improved hitboxes. It can reliably hit grounded opponents during a short hop. Back aerial deals more knockback. Up aerial has an altered animation; Mewtwo no longer faces the screen after finishing its tail sweep. Down aerial has increased range. It can reliably hit grounded opponents after a full-hop. Down aerial has more ending lag (FAF 46 → 48). Dash grab and pivot grab have slightly increased start-up lag (frame 9 → 10 (dash), frame 10 → frame 11 (pivot)), and all grabs have increased end lag (FAF 36 → 40 (standing), FAF 43 → 48 (dash), FAF 40 → 42 (pivot)). Pummel has a darkness effect, instead of an electric effect. Forward throw's Shadow Balls are smaller. Back throw deals more knockback. Back throw has an altered animation; Mewtwo tosses the opponent over its shoulder nonchalantly. Down throw deals less knockback, improving its combo potential. Shadow Ball has a smaller hitbox when fully charged. Shadow Ball reaches its full charge more quickly (138 → 123 frames). Shadow Ball, when combined with Mewtwo's faster mobility and changes to hitstun, has proper combo potential at low percentages. Uncharged Shadow Ball has more start-up (frame 6 → 9), but fully charged Shadow Ball has reduced start-up (frame 23 → 18). Confusion has increased horizontal range. Confusion no longer corrects the opponent's position to the center of the ripple, which may leave them too far away to follow up with an attack. Confusion halts Mewtwo's horizontal momentum in the air, removing most of its recovery potential. Teleport has a darker, more distinct visual effect when Mewtwo disappears and reappears. Teleport has reduced landing lag (52 → 44 frames). Teleport grants slightly more intangibility frames (frames 9-17 → 9-19). Disable briefly grants intangibility on startup. Disable has significantly more range. The hitboxes are positioned higher, giving it more difficulty hitting shorter characters, such as tiny characters or certain crouching characters. Disable has an altered animation; Mewtwo spreads its arms out without leaning forwards. The particle effect has also been changed to become a green flash of light that travels outwards at eye level, making its hitbox clearer. Mewtwo's Final Smash, Psystrike, has modified visual effects. The projectile is colored purple and white throughout the orb instead of purple at the edge and black/yellow/blue in the center. The center of the orb resembles a burst of energy instead of a vortex, and the move also causes more intense visual effects when it hits an opponent. Psystrike deals more damage (30% → 40%). Mewtwo's weight has been increased (77 → 79). Neutral attack has less startup lag (frame 6 → 5). Forward tilt deals 1% more damage, with knockback compensated. Up tilt deals 1% more damage, with knockback compensated. Up tilt's tip hitbox has an altered angle that allows it to combo much better. Forward smash has more range. Up aerial deals 1% more damage, with knockback compensated. Edge roll grants more intangibility. Shadow Ball deals more knockback. Shadow Ball deals less shield damage. 4% Extends its arm to emit a pulse of dark energy. Repeatedly pressing the attack button causes Mewtwo to sway its arm up and down to emit multiple pulses of dark energy before finishing with a dark energy-infused upward swipe. The first hit can be jab canceled, with notable follow-ups including itself, up tilt, down tilt, a grab, forward smash, and forward aerial. 11% (near), 10% (mid), 9% (far) Spins, then swings its tail forward. It is Mewtwo's strongest tilt attack, has good range and can be angled, all of which make it useful for spacing beginning at 40%. It has KO potential at under 140% against middleweights near the ledge. 7% (nearest), 6% (near), 5% (far), 4% (farthest), 5.5% (farthest hitbox to opponents in front of Mewtwo) Telekinetically backflips to swing its tail in an overhead arcing motion. Its near hitboxes' launching angles allows them to combo into themselves, an up smash, a back aerial, or an up aerial from 0% to low percentages. They can also be used for juggling beginning at medium percentages. In comparison, its far hitboxes can be used for spacing. It has overall long range, as it can hit opponents near Mewtwo's back. Tail Sweep 5% (near), 4.5% (mid), 4% (far) Crouches and spins around to swing its tail in front of itself. Due to it hitting on frame 6 and having low ending lag, it is Mewtwo's fastest tilt, which allows it to function as a good out of shield option. It is also Mewtwo's best combo starter and, like up tilt, has hitboxes that launch at different angles. As a result, it can combo into up tilt, a dashing up smash, neutral aerial, forward aerial, and up aerial. 12% (clean sweetspot), 9% (clean sourspot), 6% (late sweetspot), 4% (late sourspot) A lunging, dark energy-infused palm thrust. Its clean sweetspot deals above average knockback. Depending on the hitbox it hits with and the opponent's damage, it can combo into neutral, forward, and up aerial. Its disjointed hitbox grants it impressive range for a dash attack, which makes it a decent punishment option at certain distances, and potentially difficult for the opponent to punish from a proper distance. Shadow Blast 20% (blast), 16% (arms) Quickly cups its hands to its side, and then thrusts them forward to perform a double palm thrust that emits a blast of dark energy. It is Mewtwo's most damaging smash attack, as even its sourspot has respectable power. Due to it hitting on frame 19 and having 31 frames of ending lag, however, its is very punishable. Resembles its special move animation from Pokemon Stadium. Galaxy Force 2% (hits 1-3), 10% (hit 4) Thrusts its arm upward to emit a swirling blast of dark energy. It functions very well as an anti-air attack due to the energy blast itself being a large disjoint that covers above Mewtwo's head. Due to it hitting on frame 9, it is quite fast for a smash attack, and has the lowest amount of start-up lag out of Mewtwo's smash attacks. It hits multiple times, which makes it a useful anti-air attack. However, its 46 frames of ending lag is the highest amount of out Mewtwo's smashes, which in turn makes it very punishable. Shadow Bomb 16% Extends its arm at a diagonal angle toward the ground to emit a blast of dark energy from its fingertip. It is one of the few down smashes that does not hit on both sides, but it is powerful nonetheless, and has the highest knockback scaling out of Mewtwo's entire moveset. It has 22 frames of ending lag, which is the lowest amount out of its smash attacks, and can be interrupted rather early. As its power grants it safety against shields, it is useful for hard punishes and can be spammed rather safely. Due to it hitting on frame 21, however, it has the highest amount of start-up lag out of Mewtwo's smash attacks. Body Spark 1.6% (hits 1-5), 4% (hit 6) Discharges electricity around itself. With only 7 frames of startup, it is tied with forward aerial for having the lowest startup out of Mewtwo's aerials. Its hitboxes are positioned at Mewtwo's hands and feet and keep the opponent trapped, whereas its last hitbox launches them. As a result, it is very useful for disrupting opponents, as Mewtwo has full control over its aerial movement during the attack. Its linking hits can also drag opponents down if fast-falling, which can lead to grounded follow-ups and even gimps. Shadow Scratch 13% A dark energy-infused swipe. Due to it hitting on frame 7, it is tied with neutral aerial for having the lowest amount of start-up lag out of Mewtwo's aerial attacks. When coupled with its respectable damage output and high knockback scaling, it is one of Mewtwo's most viable KOing options. It also boasts combo potential at low percentages, as it can also combo into itself, or be used as a follow-up from down tilt or neutral aerial. Due to its very fast speed, versatility at a wide range of percentages (boasting combo and KO potential at low and high percentages, respectively), and decent range, it is a staple in Mewtwo's neutral game and moveset, and it is not uncommon for it to be considered one of the best forward aerials in the game. 13% (near), 11% (mid), 9% (far) Swings its tail in an upward arc. It has a very large range, which makes it a decent gimping option when timed properly. Due to it hitting on frame 13, however, it has the second highest amount of start-up lag out of Mewtwo's aerial attacks. A powerful edgeguarding tool due to its aforementioned reach and having high knockback at its sweetspot. 12% (near), 11% (mid), 10% (far) Backflips to swing its tail in an overhead arcing motion, similarly to its up tilt. Its good knockback growth, large range and decent damage output makes it a viable juggling and KOing option. Despite its appearance, it is unable to hit opponents next to Mewtwo, unless during a fast-fall near the ground. 14% (grounded opponents, aerial sourspot), 15% (aerial sweetspot) Backflips to perform a dark energy-infused stomp. It is Mewtwo's most damaging aerial move. It is also a very powerful meteor smash when sweetspotted in the air. Due to it hitting on frame 15, however, it has the highest amount of start-up lag out of Mewtwo's aerials. Despite its aforementioned dark energy visuals appearing right where Mewtwo stomps, it does not have a darkness effect. — Telekinetically holds an opponent. Mewtwo's overall grab range is average. 2% Releases a pulse of darkness into the opponent. A fairly fast pummel. Shadow Cannon 3% (hit 1), 2% (Shadow Balls) Telekinetically lifts the opponent diagonally in the air before firing five Shadow Balls at them. It is one of the most damaging forward throws in the game when all hits connect, dealing 13%. However, the Shadow Balls can be reflected if the opponent wears a Franklin Badge, while other nearby opponents with reflectors and/or absorption moves can choose to intercept it. 10% Telekinetically throws the opponent backward. Possessing very high knockback, it is one of the strongest back throws in the game, and one of Mewtwo's most viable KOing moves. It KOs middleweights at around 95% near the ledge. Psychic Whirlwind 12% Telekinetically whirls the opponent around itself before launching them upward above its head. This is the strongest up throw in the game, while being difficult to properly DI due to its purely vertical angle. It KOs middleweights at around 131% on Final Destination. 4% (hit 1), 5% (throw) Telekinetically slams the opponent to the ground, and then somersaults in order to strike them with its tail. It has low knockback and somewhat high ending lag. As a result, it cannot properly combo into most of its moves, though it can be used to punish an opponent's reaction. 7% Telekinetically spins around to swing its tail before getting up. 5% Performs a dark energy-infused swipe behind itself and then in front of itself while getting up. 7% Swings its tail in front of itself while climbing up. Shadow Ball 2.5% (uncharged), 25% (fully charged) Cups its hands to its side and creates a large, blackish violet sphere of dark energy between its hands, then thrusts its hands forward to launch the sphere. It can be fired immediately, which, when coupled with its erratic movement pattern, allows it to function as a pressuring option like Fireball. Conversely, it can be charge-canceled. Although its charge time is quite long, it possesses great KO potential when fully charged. A fully charged Shadow Ball also deals considerable shield damage and possesses transcendent priority, though it cannot break one with full health and can still cancel out certain projectiles. A fully charged Shadow Ball also deals recoil upon being fired; as a result, using it in midair will moderately propel Mewtwo backward, which can help or hinder its recovery. At low percentages, Shadow Ball can potentially act as a combo starter, notably into moves like dash attack or a dash grab. Confusion 1.15% (hits 1-7), 1% (throw), 1.4× (reflected projectiles) Swipes forward to emit a ripple of psychic energy from its hand. It has impressive utility, courtesy of it functioning as a reflector, a command grab, and even a potential recovery option. As a grab, the ripple spins opponents around and leaves them tumbling downward, dropping them in front of Mewtwo and allows it to follow-up with other attacks. As a recovery option, its first use in midair gives Mewtwo a slight vertical boost, although it halts most of its horizontal momentum. Teleport — Teleports to a different location. It is completely invulnerable during the move. It has less ending lag if Mewtwo Teleports directly back onto the ground, and it grants Mewtwo some horizontal momentum if ended in midair. A great recovery move due to its aforementioned intangibility as well as travelling a long, safe distance. Disable 1% Emits a minuscule spark of psychic energy from its eyes toward the opponent, stunning them. It only works if the opponent is facing Mewtwo and making eye contact with it. If the opponent is in the air, they are slightly launched backward with set knockback, instead of being stunned. Useful at high percentages to guarantee a KO, but difficult to land. Due to being a projectile, Disable can also be reflected. The move itself can be reversed. Psystrike 40% Mega Evolves into Mega Mewtwo Y and performs Psystrike, its signature move in the Pokémon games. Psystrike is a powerful sphere of psychic energy that plows through both opponents and walls, and any opponent caught will be stunned before being launched by an intense, mind-shattering blow. Emerges from a large mass of dark energy and then descends onto the ground. Up Taunt: Closes its eyes and folds its arms as it telekinetically spins around on the spot while laughing ominously. Resembles the animation Mewtwo performs while using a physical move in the Pokémon Stadium games. Side Taunt: Surrounds itself in a flame-like aura of dark energy, similarly to Lucario's up taunt. Down Taunt: After turning to face the screen, it waves its hand in a circular motion in front of itself. It then proceeds to thrust its opposite arm forward while emitting a small spark of dark energy from its palm. Crosses its arms and then moves them outward. Holds out one hand in front of itself. While radiating a dark aura, Mewtwo raises its left hand in front of itself while pulling back its right hand. Mewtwo then thrusts its right hand forward, emitting dark energy sparks from its palm. Mewtwo emits an ominous growl throughout the pose. In Japanese, it says 私は負けるわけにはいかない！, which translates to "I cannot afford to lose!" Mewtwo crosses its arms as it turns its back to the screen, and looks back over its shoulder, scoffing. In Japanese, it says 私はなぜ ここにいるのか…？, which translates to "Why am I here?" Does a single spin while levitating, then poses with a dark aura bursting from its body as it laughs. In Japanese, it says 愚かな！, which translates to "Foolish!" SDX - SDX is currently the best Mewtwo player in the world. SDX was the only representative of the character in GENESIS 6, where he placed 17th. Rxcky - Rxcky placed 9th place at Smash Erie #2 using mostly Mewtwo. Each round, through its psychic powers, Mewtwo controls previous opponents to use as teammates in future rounds; these teammates typically represent characters that have been possessed in their home series. Each round uses a track taken from the universe fought in the previous round. 2 Cloud Midgar Snowman Lucas in his Masked Man costume is a CPU ally. 3 Ryu and Ken Suzaku Castle Fight On! Cloud in his Advent Children costume is a CPU ally. 4 Richter Dracula's Castle Vega Stage Ken in his black costume is a CPU ally. 5 Palutena and Pit Skyworld Lament of Innocence Richter in his black costume is a CPU ally. 6 Pikachu, Pichu, Jigglypuff, and Lucario Kalos Pokémon League Destroyed Skyworld Pit in his black costume is a CPU ally. Final Master Hand and Crazy Hand Final Destination Battle! (Lorekeeper Zinnia) Pikachu with Red's hat is a CPU ally. Mewtwo was among the fighters that were summoned to fight the army of Master Hands. Mewtwo was present when Galeem unleashed his beams of light. Mewtwo and Zelda attempted to reflect the beams using Confusion and Nayru's Love respectively; this effort failed, with both being vaporized and placed under Galeem's imprisonment, along with the rest of the fighters (excluding Kirby). Mewtwo was one of the many fighters that fell under Dharkon's control upon Galeem's first defeat. It can be found in the Mysterious Dimension sub-area, where its location will be accessed during the quiz segment asking which spirit cannot be inhaled by Kirby (the answer being Whispy Woods). Mewtwo's Fighter Spirit can be obtained by completing Classic Mode. It is also available periodically for purchase in the shop for 500 coins. Unlocking Mewtwo in World of Light allows the player to preview the first spirit below in the Spirit List under the name "???". As a Fighter Spirit, it cannot be used in Spirit Battles and is purely aesthetic. Each Fighter Spirit has an alternate version that replaces them with their artwork in Ultimate. Additionally, one of Mewtwo's Mega Evolved forms appears as a Primary Spirit. •The enemy has increased jump power WarioWare, Inc.
Mewtwo idling on Wily Castle. Releasing a Shadow Ball on Spirit Train. Taunting with Lucario and Fox on Coliseum. Using Disable on Rosalina on Pokémon Stadium. In its black alternate color with Pikmin on Onett. Battling Pichu on Spear Pillar. Mewtwo's artwork for Ultimate resembles its artwork for Pokémon FireRed/LeafGreen, albeit with its hands and legs posed slightly differently. Mewtwo was confirmed to be a playable character in Ultimate before Pikachu, making this the first time Pikachu was not the first Pokémon to be announced as part of the roster. Mewtwo was the last non-DLC character added to the Super Smash Bros. Blog. However, due to Mr. Game & Watch's blog page only being available on the Asian websites until December 7, Mr. Game & Watch was the last character added to the blog on non-Asian websites. In Team Battles, there's a graphical glitch where if Mewtwo is positioned the furthest behind the leading character on either the left or right side, the aura and energy effects will not play. Mewtwo is the only character who has its victory grunts/laughter omitted from the English Sound Test. This page was last edited on April 18, 2019, at 18:35.